The number of corporate barter companies worldwide has declined in the last fifteen years due to “roll-up” acquisitions of smaller companies by the larger corporate barter and media companies. Despite there being fewer corporate barter exchanges in operation, the volume that the remaining corporate barter exchanges does annually is impressive – approximately 30% of industry volume. Corporate barter company’s clients are large companies (often times manufacturers) with obsolete or excess inventories, under-utilized plant capacity or real estate. 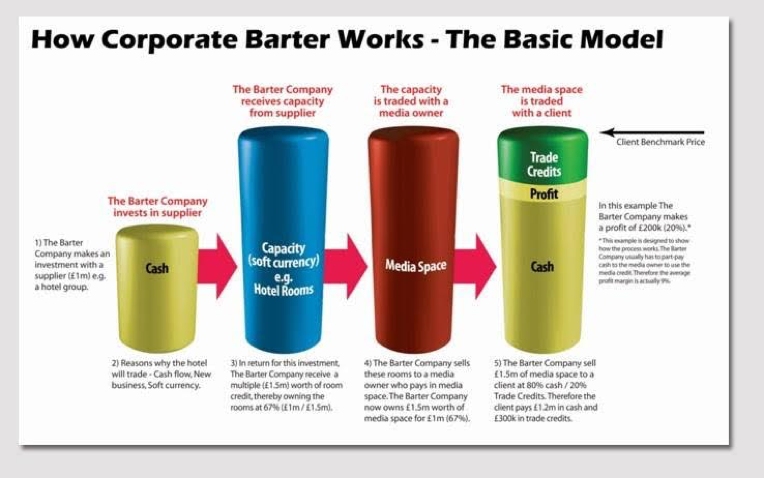 Corporate barter companies use their own trade corporate trade credit to purchase these inventories and use their acquired media and other acquired goods and services as well. Many of the largest retail barter exchanges include an in-house corporate barter division as part of their services.